On the way to Okongo on February 16, 2018, I asked the Holy Spirit to guide me on this unique mission of introducing the Oblates’ Program to the parishioners of All Saints Parish in Okongo. I was invited by Sr. Beate Schrőter OSB and our Okongo Community who have been thinking of beginning an Oblates program with the faithful around the mission area. On Sunday, February 18, around 36 parishioners with their children came for the Service of the Word, for a delayed Ash Wednesday blessing of ashes, and for the praying of the Stations of the Cross in the newly-built Parish Church. Our Okongo out-station does not have a resident priest yet, a challenge for a mission station that is trying its best to bring Christ to the people in this part of the country. After refreshment in the Parish Hall, Sr. Beate introduced me to the parishioners. I started the sharing by singing three Oshikwanyama songs “Twaitavela”, “Ndina Yesu”, “Mwene Mwene Tambula” to the delight of the audience. Some pictures of St. Benedict were shown on the screen as I began to talk about his brief biography and his miracles, and the story of the first Oblates, Sts. Maur and Placid. Likewise, I shared my Benedictine vocation and how St. Benedict and St. Scholastica have been helping me. Meme Rita Iita, who has observed and attended our Oblates’ meeting and recollection in the Priory House in Windhoek, translated in Oshikwanyama my talk on the requirements for becoming an Oblate. The prospective candidates were assured that the Sisters of Okongo mission will teach them the Rule of St. Benedict and the teachings of the Catholic Church. As associates of the Sisters they will help the Sisters promote good vocations and join their common prayer and apostolate when they can. Most of all, they will commit to live the Benedictine spirituality in their respective way of life. An interesting question was raised by a parishioner: If he owns a cuca shop (a bottle store), can he be an Oblate?” The answer flew in from another parishioner: “It is good to earn a living through a small business, but it would be good to change the cuca shop which is often the cause of drunkards fighting and killing each other.” After lunch we resumed the sharing and introduced a simple group “Lectio Divina” which a Benedictine Oblate does every day as far as possible. May all the Saints, especially Sts. 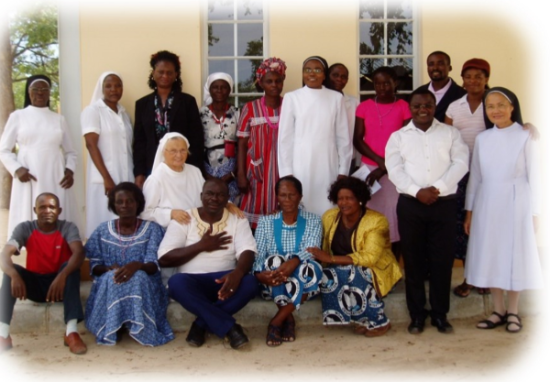 Benedict and Scholastica, intercede to make the Oblates program a reality in Okongo mission.